England has the second highest rate of tuberculosis (TB) among Western European countries and rates are nearly five times higher than in the United States. In 2013, there were 7,290 cases of TB reported in England, equal to 13.5 cases per 100,000 of the population. As a result of this NHS England in collaboration with Public Health England have developed a Collaborative Tuberculosis Strategy. It is a national initiative aiming to tackle the growing issue of TB in England. Latent (or dormant) TB infection (LTBI) means the infected person has no symptoms and this can remain undetected in the person’s system for years. It is likely that the majority of TB (known as active TB) cases in the UK are the result of ‘reactivation’ of Latent TB. The disease can be diagnosed by a single blood test and treated effectively with antibiotics, preventing TB disease in the future. What is a Latent Tuberculosis Infection Screening programme? Latent Tuberculosis Infection Screening programme is a result of collaboration between NHS England and Public Health England as a response to the rising numbers of identified TB and Latent TB cases in England. Latent TB infection screening programme aims to test and then treat people identified with Latent TB. This preventative approach ensures that patients with Latent TB receive much needed treatment and that will protect them from developing full blown active TB. Some GP practices in Crawley are already offering free testing to those people who meet the eligibility criteria. This programme will also be working closely with a number of Community Groups and the local TB team to raise awareness about TB among the most vulnerable groups. Why Latent Tuberculosis Infection Screening programme in Crawley? According to the National Enhanced Tuberculosis Surveillance System (ETS) that collects information on all new TB cases, between 2010 and 2014 there were 92 cases of active TB among residents from Crawley with an average rate of 21.5 per 100,000 population per year. Over 50% of these cases had pulmonary TB (that is in the lungs) and these are potentially contagious and require robust follow up of close contacts, e.g. family members, work colleagues, etc. Therefore Crawley town has been identified with high numbers of TB cases and so it is within our interest to ensure patients meeting the eligibility criteria are invited to receive a free test. The TB service is a team of nurses and doctors available to support people with or being tested for TB. They offer advice, support and appointments for all issues relating to TB. The services offered include; support with treatment, tracing of people who may have been in contact with TB and health education for patients, healthcare staff and third sector organisations. This team is managed by specially trained nurses and doctors to support you and/or your family. 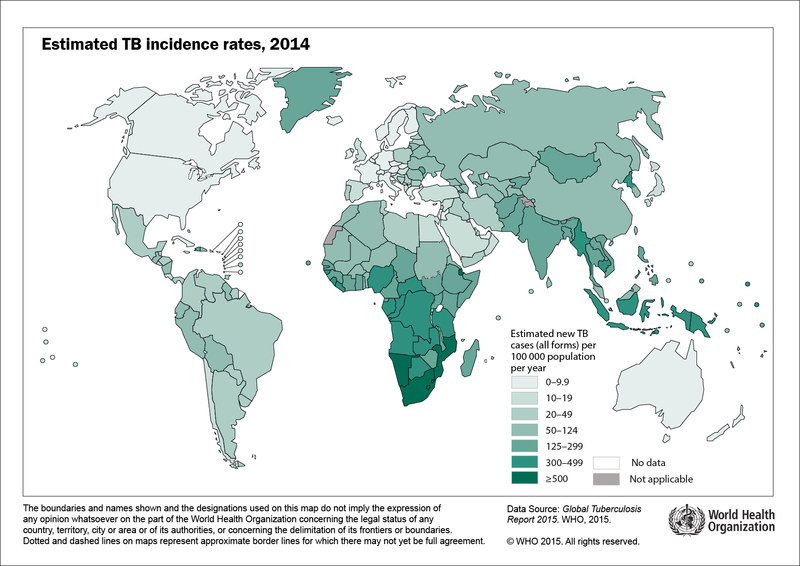 A world map showing countries with high rates of TB. Latent tuberculosis infection (LTBI)- Frequently asked questions.